Who will be Thailand’s Number One cheerleader? Over the last two Saturdays, all of the CMAC schools came together at APIS for the under 13, under 16 and under 20 Futsal championships for local international schools. After a heavy overnight thunderstorm on the first day, the weather turned out perfectly for some exciting, hard-fought and often skilful play. Grace and APIS U20 girls in action. In the girls’ section of the U16, CMIS took third place, Lanna came runners-up and the very talented team from Grace were the winners. Lanna International School (LIST) did particularly well overall in the U16s competition, as they also boasted the second-placed team in the boys’ championship. 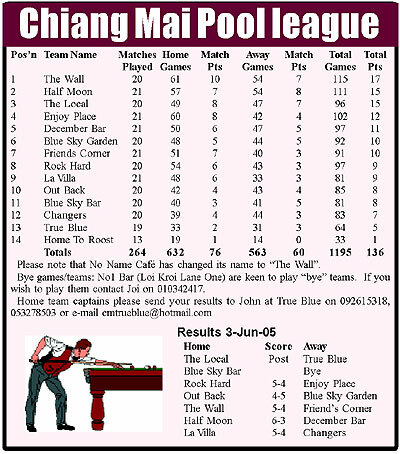 Three teams were tied on points for third place, but with a better goal difference, APIS took the honors. APIS looks on as the U16 Boys Final is underway. With very powerful performances throughout the day, and throughout the home-and-away games, Nakorn Payap International School (NIS) came through undefeated to finish in top place for the boys’ competition this year. In the under 13 events, CDSC, the German Christian School in Chiangmai, won its first CMAC championship, narrowly beating Grace in the girls’ event, while Lanna won the boys’ event with very strong performances from all players. The tournaments were rounded off with matches for the under 20 sides last weekend. The CMIS boys successfully defended their title from last year, edging APIS into second place over three close games. APIS also had a very successful championship in the girls Under 20s, being runners-up again, this time to Grace. Overall, Grace, Lanna and APIS were the most successful place-getters in this years’ contest. Congratulations to all the teams and the winners. In this year’s To Be Number One Cheerleader Thailand Championship, contestants will compete for a trophy presented by HM The Queen and almost a million baht in scholarships. The champions will represent Thailand during future international competitions. This is an activity encouraging Thai youth to reject drugs. The competition is divided into regional and national levels, while regional champions will receive a trophy presented by HRH Princess Sirindhorn and a scholarship for 50,000 baht. 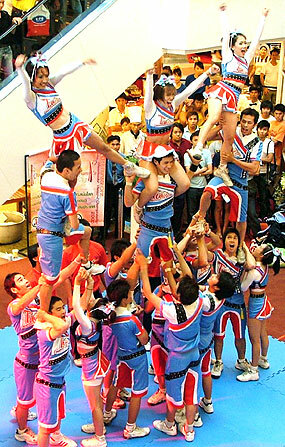 The Cheerleader Association of Thailand (C.A.T) was established on March 8, 2005 and appointed Sutho Neewankoon as its president. Sutho explained that the objectives of the association are to create a good relationship between cheerleader clubs and cheerleader’s members, and to raise Thailand’s cheerleading standard. Chiang Mai’s favorite foreign football team, the Farangutans, crashed to their worst ever defeat last week. Under-strength and overweight, the Western Wizards went into the match against the Royal Thai Air Force at Hang Dong on the back of a poor run of form, desperate to find goals and a semblance of teamwork. Alas, it was not to be. To their credit, the foreign devils battled hard in the first half and, thanks to the solo runnings of Adam up front, were able to net twice in the rainy conditions, going in 3–2 down at the interval. However, in the second period, the legs and confidence seemed to evaporate and the RTAF responded by cracking in a succession of breakaway goals. Of course, Yours Truly here could have turned things around at 4–2 when a looping ball found him alone in the penalty box. However, the veteran Scot proved himself to be no Duncan Ferguson, and his woeful header bounced harmlessly into the grateful keeper’s hands. The introduction of Aung Naing caused anxious moments occasionally, but for the most part, the Siamese Squaddies were comfortable to pass the ball around in midfield while our hapless harriers ran around like headless chickens. Late in the game, with only pride to play for, the farangs managed to stitch a few plays together, but it was never going to be their day. No Liverpool-style comeback this time. If any foreigner over 35-ish reads this cry for help and thinks he or she can endure a game of footie with our beleaguered bevy merchants, just write to us at: farangutan [email protected] or check out: www.goecities.com/farang utans. Conscription may soon become mandatory. A national youth water bottle rocket competition will be held at Maejo University. An exhibition also offers opportunities to learn about science. The National Science Museum has held the competition since 2002 and this year, 587 teams have entered. The northern leg of the competition will take place at Maejo University on July 16-17, and accepts 200 teams of school representatives studying in grade 4 and 6 to launch their rockets accurately over a distance. The best 25 teams will receive 500 baht each and will represent the North at national level at the National Science Museum, Pathumthani on August 19-21 to find the last 20 teams for the final competition on October 22. The exhibition it will be held on July 14-17 entitled “Science is not hard”. Whoever interested in the competition could contact to National Science Museum at 0-2577-9999 # 1829, 1830 or fax: 0-2577-9911 since June 24. 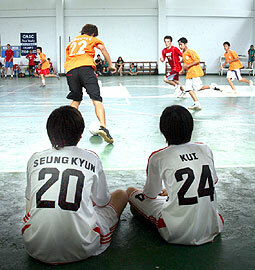 Application fee is 100 baht per a team but people can watch the competition free.